Cheerios are a breakfast cereal brand made from puffed oats in a distinctive ‘O’ shape that has been popular with children and adults since the 1940s. The Cheerios brand is owned by a US based cereal company – General Mills and is also marketed by Nestle in the UK and as many as 130 countries around the world where Nestle operates. Cheerios are available in a wide range of flavors and styles and it is advertised as a healthy and nutritious breakfast. The breakfasts of 19th century were typically made up of fried eggs, sausages, bacon and perhaps with toast as well. A healthy diet wasn’t yet considered very important yet a number of medical professionals working in hospitals had noticed their patients responded better to intestine and urinary tract problems, even to mood swings if they ate a more balanced diet filled with vegetables and cereals. Unfortunately, cereals proved difficult to make into convenient meals and a number of experiments were attempted that would produce bite-sized cereal nuggets. It was until the 20th century with the advent of modern food and pressure cookers that cereals were able to be used as the main ingredient. The marketing of first breakfast cereals such as corn flakes and grape nuts were around the turn of the century and sold surprisingly well encouraging other mills and hospitals to develop their own cereal brands, among them was the General Mills which first entered the breakfast cereal market with their product – Wheaties. Cheerios made from puffed oats were first introduced in 1941 but nearly didn’t happen at all. Lester Borchardt , the inventor of Cheerios and a team of people at General Mills had tried to invent a machine they could use to create puffed cereal such as puffed wheat and after spending a great deal of money and time on the technique without result they were told by Borchardt’s boss to give up the project. Borchardt was a determined employee who knew the idea was sound and decided to keep developing the machine. After two months they were rewarded with success and General Mills had a new product. 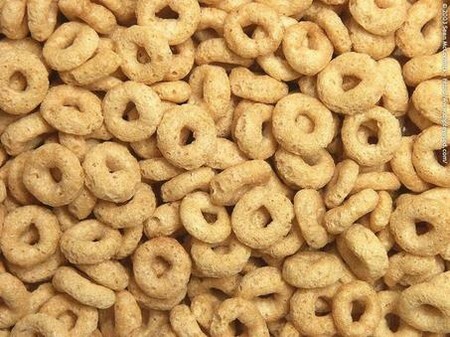 The marketing of Cheerios was done in quite aggressive way as Cheeri Oats, but another company was already using the name and after a short dispute General Mills management agreed in 1945 to change the name to Cheerios, this name has been kept to the present day. Beginning in the early 1940s, around the time the Cheerios brand was being marketed the company created a cartoon character named Cheeri O’Leary as its brand icon. At that time television had not reached critical mass yet so the character was used in both animated form and printed form proving popular with children. Competition with Kelloggs who had a strong popularity and a loyal following required innovative thinking and General Mills under the direction of the company owner James Bell were inspired to sponsor a radio show aimed at children yet with a moral story to every episode, by a happy coincidence the creator of the Lone Ranger was in need of a sponsor to get the show organized throughout the United States beginning in 1949. The association with the Lone Ranger continued for 20 years and helped drive Cheerios into the top spot as the most popular breakfast cereal. The early 1950s saw Cheerios develop a new character to replace Cheery O’Leary who had become outdated. Television viewing numbers were at a point that Cheerios could now be marketed on TV exclusively resulting in the Cheerios Kid and Sue hitting the airwaves. Typically the ads showed Sue getting into a difficult situation and calling for help from the Cheerios Kid who would use a combination of muscle and intelligence to come up with a solution to her problem and in doing so reinforcing the message that Cheerios were a healthy breakfast. Further advertising innovations created by General Mills were the idea that the packaging for Cheerios need not to be contained only the cereal. Through the late 1940s and 1950s General Mills marketing department successfully co-branded boxes of Cheerios with the Disney company to offer exclusive discounts on comic books and then as advertising for the newly launched Mickey Mouse Club in 1956. By 1961 the association with the Lone Ranger helped with an opportunity to increase sales of Cheerios cereal with a joint release of Lone Ranger and Silver action figures inside the cereal box. This was an innovation that took the cereal world by storm and revolutionized the marketing of the product. The Cheerios brand was also used for good effect in the mid 1960s when its packaging was chosen as the main source to promote a new social and charitable endeavor known as Project Head Start started by General Mills. A small percentage of the earnings received from the sale of every box of Cheerios was donated to the foundation. The goal was to provide education and healthcare services to needy and disadvantaged families in the United States. From the late 1970s till the present time, General Mills introduced a chain of cereals that were versions of the original Cheerios. Cheerios was aware that it was facing competition from new cereal brands that were sweeter and more colorful. Honey Nut Cheerios were added to the supermarket shelves in 1979 and heralding the start of new research into alternative flavors and varieties of Cheerios. This saw the introduction of the Apple Cinnamon flavor in 1988, MultiGrain Cheerios in 1992, Frosted Cheerios in 1995, Millenios in 2000 and finally Berry Burst Cheerios in 2003. Health wise Cheerios have been well received by the consumers, starting with claims from General Mills that Cheerios provide all of the “essential nutritional values of oatmeal”. A claim was proven in 1988 when studies proved that oat bran helps in the fight against high cholesterol. By 1999 and after a thorough evaluation of all breakfast cereals, Cheerios is declared the only cereal able to help reduce cholesterol in populations needing a low fat diet and it is also endorsed by the Heart Foundation as a recommended breakfast cereal. The product has been a success throughout its history. In 2009, the cover of the Cheerios box was featured with Shawn Johnson – an Olympic gold medalist and World Champion gymnast, he became the first ever athlete featured on the cover of the Cheerios box. Cheerios is a popular product among children and many of the television commercials for Cheerios have targeted children with animated characters like the animated Honeybee. Cheerios has been a family favorite cereal for decades and its wholesome goodness is full of nutrition and ideal for breakfast and snacks.